Sara is a graduate of Mars Hill College where her professors used to say that she’d make a good biologist if she could get her mind off horses. Lucky for us, she couldn’t! Sara first began working at Rockmont in 2000, and became the Riding Director in 2009. She is certified in Hunt Seat and Recreational Riding through the American Riding Instructor Association, has been an equestrian coach for the Buncombe County Special Olympics, and has participated in many horse shows and TREC competitions. In addition to running the summer program for Rockmont, Sara teaches off-season riding lessons through Lighter Mount Horsemanship, is a trainer of Paso Fino horses at Fairwinds Farm, manages the Biltmore Ride and Tie and the Rockmont Horse Show, and serves as a vet assistant with the Appalachian Equine Veterinary Service. 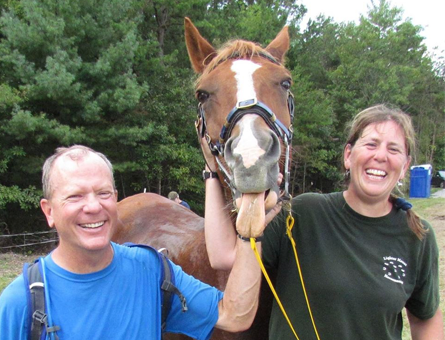 Horses are Sara’s passion and she loves sharing that passion with the campers of Rockmont!